Phenylalanine (abbreviated as Phe or F) is an α-amino acid with the formula C6H5CH2CH(NH2)COOH. This essential amino acid is classified as nonpolar because of the hydrophobic nature of the benzyl side chain. L-Phenylalanine (LPA) is an electrically neutral amino acid used to biochemically form proteins, coded for by DNA. The codons for L-phenylalanine are UUU and UUC. Phenylalanine is a precursor for tyrosine, the monoamine signaling molecules dopamine, norepinephrine (noradrenaline), and epinephrine (adrenaline), and the skin pigment melanin. Phenylalanine is found naturally in the breast milk of mammals. 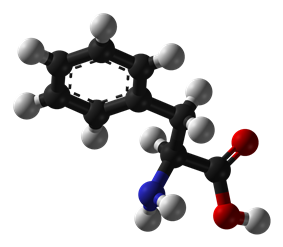 It is used in the manufacture of food and drink products and sold as a nutritional supplement for its reputed analgesic and antidepressant effects. It is a direct precursor to the neuromodulator phenylethylamine, a commonly used dietary supplement. The genetic codon for phenylalanine was first discovered by J. Heinrich Matthaei and Marshall W. Nirenberg in 1961. They showed that by using m-RNA to insert multiple uracil repeats into the genome of the bacterium E. coli, they could cause the bacterium to produce a polypeptide consisting solely of repeated phenylalanine amino acids. This discovery helped to establish the nature of the coding relationship that links information stored in genomic nucleic acid with protein expression in the living cell. Phenylalanine is the starting compound used in the flavonoid biosynthesis. Lignan is derived from phenylalanine and from tyrosine. Phenylalanine is converted to cinnamic acid by the enzyme phenylalanine ammonia-lyase. The genetic disorder phenylketonuria (PKU) is the inability to metabolize phenylalanine. Individuals with this disorder are known as "phenylketonurics" and must regulate their intake of phenylalanine. A (rare) "variant form" of phenylketonuria called hyperphenylalaninemia is caused by the inability to synthesize a cofactor called tetrahydrobiopterin, which can be supplemented. Pregnant women with hyperphenylalaninemia may show similar symptoms of the disorder (high levels of phenylalanine in blood) but these indicators will usually disappear at the end of gestation. Individuals who cannot metabolize phenylalanine must monitor their intake of protein to control the buildup of phenylalanine as their bodies convert protein into its component amino acids. Phenylketonurics often use blood tests to monitor the amount of phenylalanine in their blood. Lab results may report phenylalanine levels in different units, including mg/dL and μmol/L. One mg/dL of phenylalanine is approximately equivalent to 60 μmol/L. 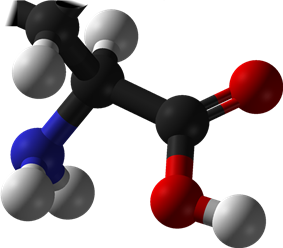 A non-food source of phenylalanine is the artificial sweetener aspartame. This compound, sold under the trade names Equal and NutraSweet, is metabolized by the body into several chemical byproducts including phenylalanine. The breakdown problems phenylketonurics have with protein and the attendant buildup of phenylalanine in the body also occurs with the ingestion of aspartame, although to a lesser degree. Accordingly, all products in Australia, the U.S. and Canada that contain aspartame must be labeled: "Phenylketonurics: Contains phenylalanine." In the UK, foods containing aspartame must carry ingredient panels that refer to the presence of "aspartame or E951" and they must be labeled with a warning "Contains a source of phenylalanine." In Brazil, the label "Contém Fenilalanina" (Portuguese for "Contains Phenylalanine") is also mandatory in products which contain it. These warnings are placed to aid individuals who have been diagnosed with PKU so that they can avoid such foods. Geneticists have recently sequenced the genome of macaques. Their investigations have found "some instances where the normal form of the macaque protein looks like the diseased human protein" including markers for PKU. The enantiomer or as a component of the racemic mixture. It does not participate in protein biosynthesis although it is found in proteins in small amounts - particularly aged proteins and food proteins that have been processed. The biological functions of D-amino acids remain unclear, although D-phenylalanine has pharmacological activity at niacin receptor 2. DL-Phenylalanine (DLPA) is marketed as a nutritional supplement for its supposed analgesic and antidepressant activities. DL-Phenylalanine is a mixture of D-phenylalanine and L-phenylalanine. The reputed analgesic activity of DL-phenylalanine may be explained by the possible blockage by D-phenylalanine of enkephalin degradation by the enzyme carboxypeptidase A. The mechanism of DL-phenylalanine's supposed antidepressant activity may be accounted for by the precursor role of L-phenylalanine in the synthesis of the neurotransmitters norepinephrine and dopamine. Elevated brain levels of norepinephrine and dopamine are thought to have an antidepressant effect. D-Phenylalanine is absorbed from the small intestine and transported to the liver via the portal circulation. A small amount of D-phenylalanine appears to be converted to L-phenylalanine. D-Phenylalanine is distributed to the various tissues of the body via the systemic circulation. It appears to cross the blood–brain barrier less efficiently than L-phenylalanine, and so a small amount of an ingested dose of D-phenylalanine is excreted in the urine without penetrating the central nervous system. L-Phenylalanine is an antagonist at α2δ Ca2+ calcium channels with a Ki of 980 nM. At higher doses, this may play a role in its analgesic and antidepressant properties. ^ Dawson, R. M. C. et al. (1959). Data for Biochemical Research. Oxford: Clarendon Press. ^ IUPAC-IUBMB Joint Commission on Biochemical Nomenclature (1983). "Nomenclature and Symbolism for Amino Acids and Peptides". Recommendations on Organic & Biochemical Nomenclature, Symbols & Terminology etc. Retrieved 2007-05-17. ^ Plimmer, R. H. A. (1912) . Plimmer, R. H. A.; Hopkins, F. G., ed. The Chemical Composition of the Proteins. Monographs on Biochemistry. Part I. Analysis (2nd ed.). London: Longmans, Green and Co. pp. 93–97. Retrieved 2012-06-04. ^ Broadley KJ (March 2010). "The vascular effects of trace amines and amphetamines". Pharmacol. Ther. 125 (3): 363–375. ^ Lindemann L, Hoener MC (May 2005). "A renaissance in trace amines inspired by a novel GPCR family". Trends Pharmacol. Sci. 26 (5): 274–281. ^ Nelson, D. L.; Cox, M. M. (2000). Lehninger, Principles of Biochemistry (3rd ed.). New York: Worth Publishing. ^ Gibbs, R. A. et al. (2007). "Evolutionary and Biomedical Insights from the Rhesus Macaque Genome" (pdf). Science 316 (5822): 222–234. ^ "D-phenylalanine". IUPHAR. Retrieved 24 June 2014. ^ Christianson, D. W.; Mangani, S.; Shoham, G.; Lipscomb, W. N. (1989). "Binding of D-Phenylalanine and D-Tyrosine to Carboxypeptidase A" (pdf). Journal of Biological Chemistry 264 (22): 12849–12853. ^ Mortell KH, Anderson DJ, Lynch JJ, et al. (March 2006). "Structure-activity relationships of alpha-amino acid ligands for the alpha2delta subunit of voltage-gated calcium channels". 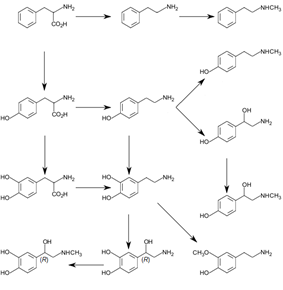 Bioorganic & Medicinal Chemistry Letters 16 (5): 1138–41. ^ Glushakov, AV; Dennis, DM; Morey, TE; Sumners, C; Cucchiara, RF; Seubert, CN; Martynyuk, AE (2002). "Specific inhibition of N-methyl-D-aspartate receptor function in rat hippocampal neurons by L-phenylalanine at concentrations observed during phenylketonuria.". Molecular psychiatry 7 (4): 359–67. ^ a b Glushakov, AV; Dennis, DM; Sumners, C; Seubert, CN; Martynyuk, AE (Apr 1, 2003). "L-phenylalanine selectively depresses currents at glutamatergic excitatory synapses.". Journal of neuroscience research 72 (1): 116–24. ^ Glushakov, AV; Glushakova, O; Varshney, M; Bajpai, LK; Sumners, C; Laipis, PJ; Embury, JE; Baker, SP; Otero, DH; Dennis, DM; Seubert, CN; Martynyuk, AE (February 2005). "Long-term changes in glutamatergic synaptic transmission in phenylketonuria.". Brain : a journal of neurology 128 (Pt 2): 300–7. ^ Möller, HE; Weglage, J; Bick, U; Wiedermann, D; Feldmann, R; Ullrich, K (December 2003). "Brain imaging and proton magnetic resonance spectroscopy in patients with phenylketonuria.". Pediatrics 112 (6 Pt 2): 1580–3. ^ Sprenger, G. A. (2007). "Aromatic Amino Acids". Amino Acid Biosynthesis: Pathways, Regulation and Metabolic Engineering (1st ed.). Springer. pp. 106–113.